~ Observing life from the saddle of my bike. A slow end to summer. There is a pigeon sitting on her nest in the cypress ignoring the fact it’s autumn. I check her everyday and leave a bowl of fresh water within sight. You see, I am filled with guilt. Her late nesting may be my fault. A few weeks earlier her chick had fledged and miscalculating its aim, landed on the wrong side of the fence and into my daughters garden. 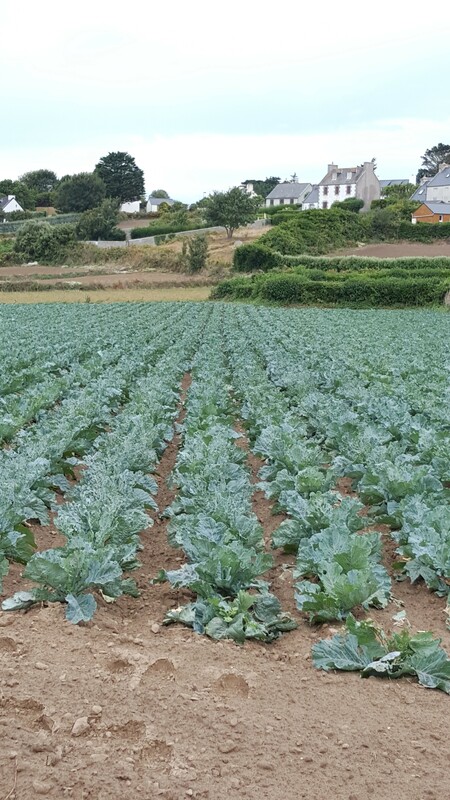 A garden so well enclosed (to keep Blathín, my daughters little hound in) that it was unable to get to the safety of the large grassy blackberry filled field it had been hoping for. Baby pigeons are unable to fly for their first few days and so they hide among grasses and thickets camouflaging themselves until they are. This little creature hid among the raspberry canes and the hawthorn and wild rose hedging. It camouflaged itself so well that I would never have known of its presence only for Blathíns fixated sniffling there. Now, the baby pigeon was safe while it remained in the thorny thicket but, I knew if it tried to come onto the lawn to practice its flying skills, herself would be waiting to snaffle it. Drastic measures were called for. Armed with a broom in one hand and grasping B on her lead in the other (I wouldn’t have found the chick on my own) we managed to flush the creature out of her hiding place and herd her along the hedge, through the tall firs, out through the gate and down the lane. It was an obedient little being and wobbled ahead of us much like a domesticated duck and allowed itself be guided by the outstretched broom which prevented it from scooting off to the left or right. When we reached the field, I left her to make her way through the overgrown grass to where her parents would hopefully find her. But later I wondered if it was an ‘out of the frying pan into the fire’ scenario ? Had I, in saving her from my daughters dog, actually delivered her into the hands of Mr fox. And is that why her parents were having a second desperate go at reproducing their genes so late in the year, ignoring the fact that summer was actually over. Then one day I see the chick, peering over the edge of the nest. So I cannot sneer at their optimism where the seasons are concerned. To tell the truth I too am reluctant to let go the idea that the summer is well and truly finished. As I sit here looking across at sugarloaf barely visible in the dark and listening to the rain pattering on my window, I do what people do who cling to the memories. I scroll through my summer photos. This year Summer actually began in spring. April to be exact. Even the cows knew that. I headed westward to the Burren. June appeared and I was off again this time to Connemara where we huddled not under an umbrella but a parasol! July was the month for contented cattle, camping at the place of the hare, a month for foraging for mussels and early morning swims, for solitudinal glasses of wine among the harebells and catching up with some reading. But what about August you might wonder? Ah! August was the highlight. August brought me my fifth grandchild and first granddaughter. A wonderful end to a beautiful summer. I tiptoe out to look a my pigeons nest. Over the fence two fat pigeons are plucking at the last of the berries from an overgrown elderberry bush whose branches are sweeping low and entangling in the long grass. And in that grass well hidden from fox and dog is the small form of a Pigeon chick. Part One: I arrive on The Island. 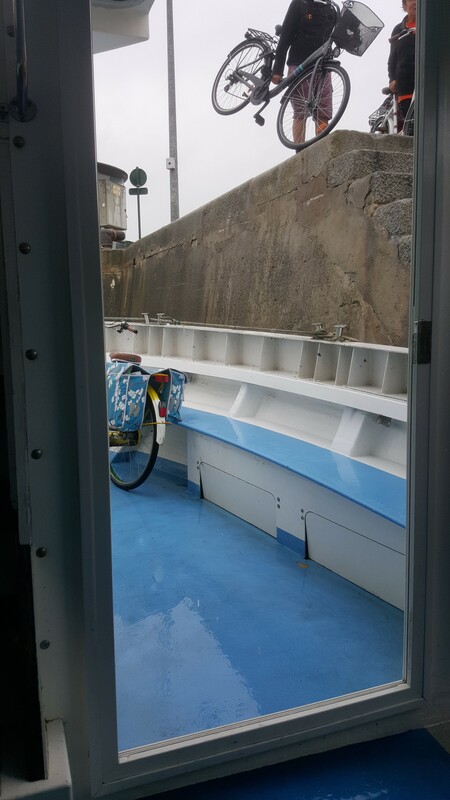 The first thing that struck me as I stood in the rain waiting for the small ferry that plied backwards and forwards between Roscoff and the island, was the happiness of the people around me. It may have been bucketing down from the heavens but they piled on that boat, laughing and chatting as though it was the sunniest day the summer could offer them. Old ladies with pulley baskets, elderly men with shopping bags, glamorous people with beautiful dogs, walkers with the correct gear and a crowd of teenagers hauling tents and their belongings. And not a scowl between them. 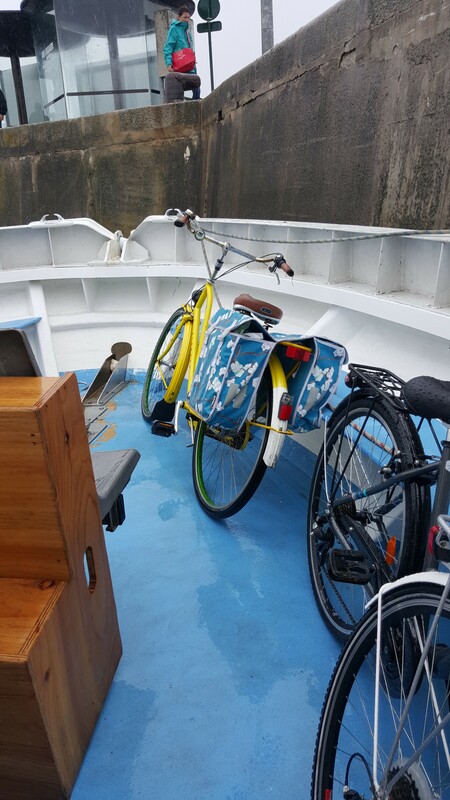 The handsome young man who lifted my heavily laden Yellow bicycle as though it was as light as a feather and of no inconvenience to his strength, smiled and placed it carefully along with the other two on the front deck. It stood forlornly, water dripping off it’s panniers (and into them too as I discovered later) while the other two bicycles, if bicycles could, were smiling along with everyone else. Some people leaned forward, regarding me with interest as I took my seat and greeted me with a merry ‘Bonjour’. I would guess this was not because they recognised me as someone not from the island, (I’m sure there were others like me coming for the first time) but because I was the only one NOT smiling. Rain belonged in Ireland for heaven’s sake and you see I hadn’t accounted for it here in France. I also didn’t expect everything to be so straightforward and had giving myself too much time when arranging meeting the woman of the house to collect the keys of what would be my home for the next week. I could expect to be out in this rain for another three hours. But I found I couldn’t help smiling back at them as I replied to their greeting. 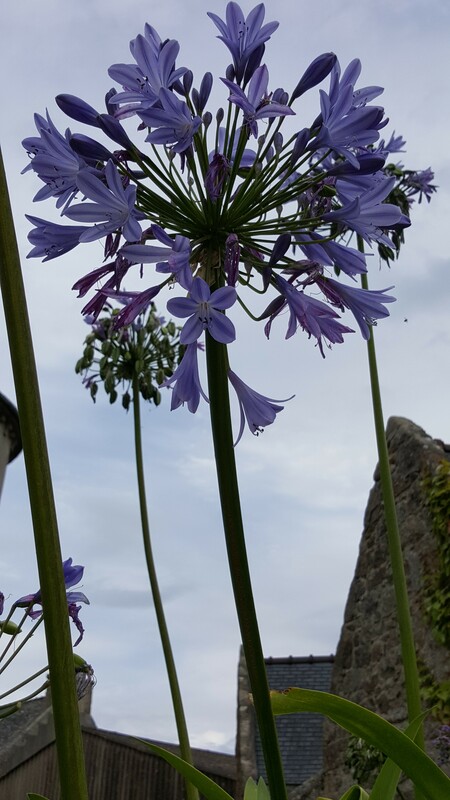 The second thing that struck me, fifteen minutes later, as I pushed the yellow bicycle with its sodden belongings up the hill from the harbour and past an old church, was the Agapanthus. It grew so profusely that in places it blocked my views of the sea. Blue stars reaching to the heavens. I was beginning to smile again. Add to that the wild sea which I could now get a glimpse of (I had reached the brow of the hill) and surely that was a white beach in the distance reached by small sandy roadways scattered without plan. The rain was beginning to ease now. 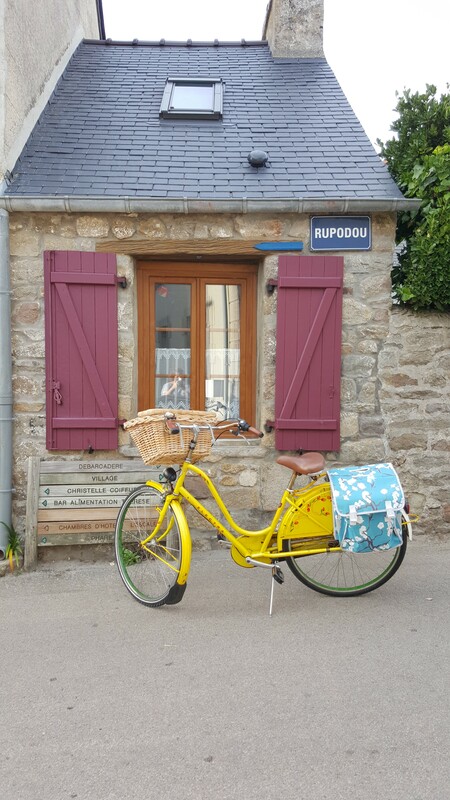 The last thing that struck me (but should have been the first that I mentioned) were the gorgeous colorful shutters surrounding small lace curtained windows that I whizzed past as I freewheeled down the other side of the hill. 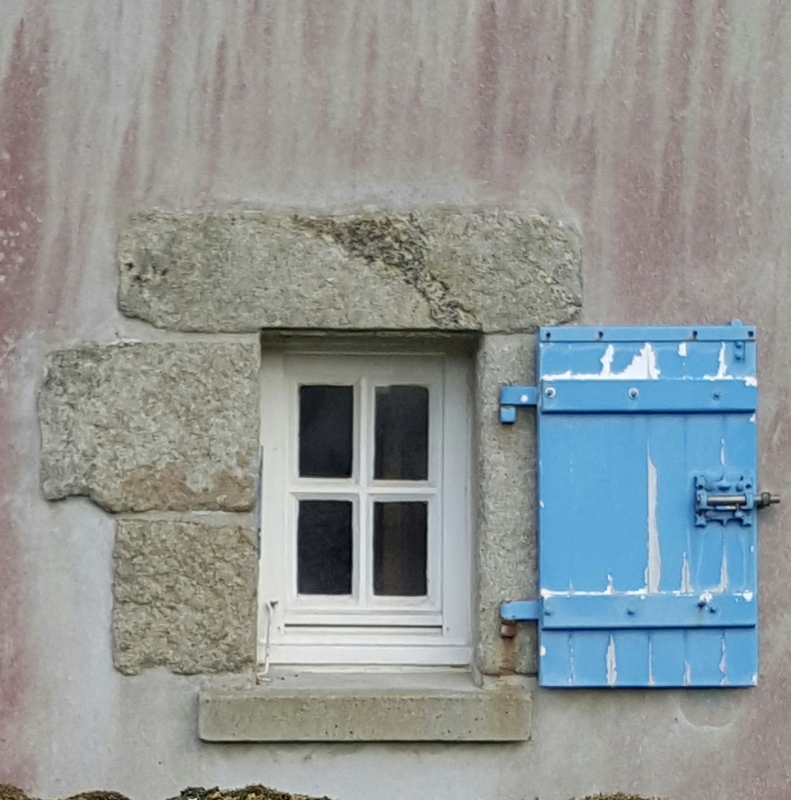 And for the length of my stay those windows stopped me in my tracks time and time again and me smile. 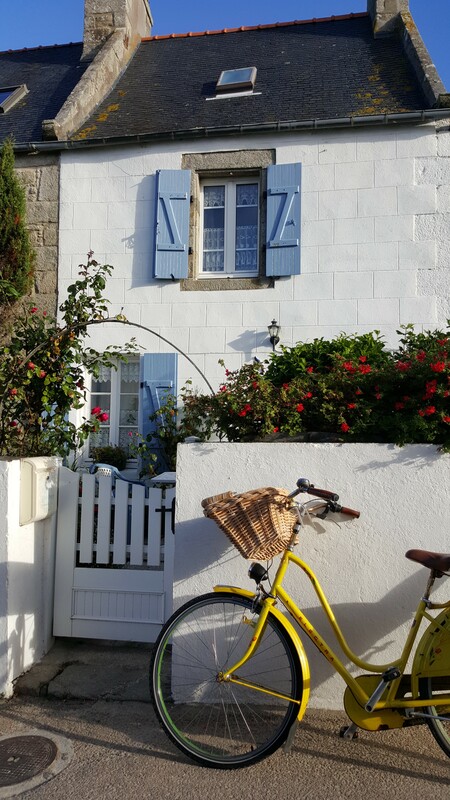 “Happiness is the biggest window a house can have” wrote the poet, Mehmet Murat Ilden. 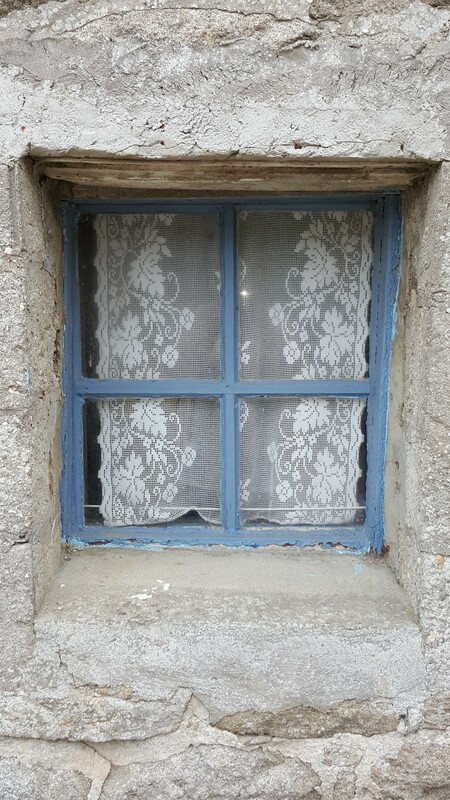 Well that must be so, as it did not seem to matter that the windows of the houses here were small because the people continued to exude happiness the whole time I was on the island. 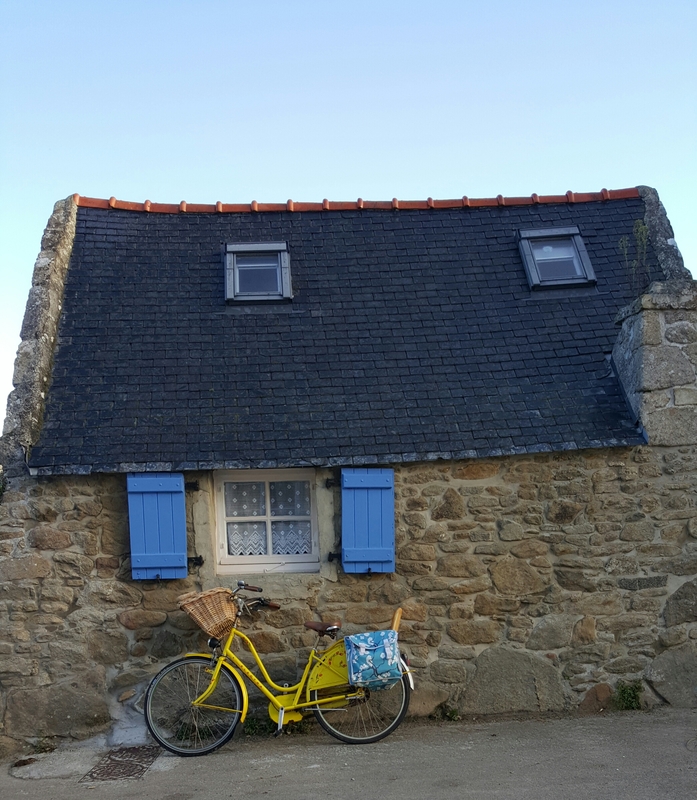 The Island of Ile de Batz lies a 15 minute boat ride off the town of Roscoff which is on coast of brittany. It is the only small island (and I have been on a good few of them) where even cycling is going too fast. 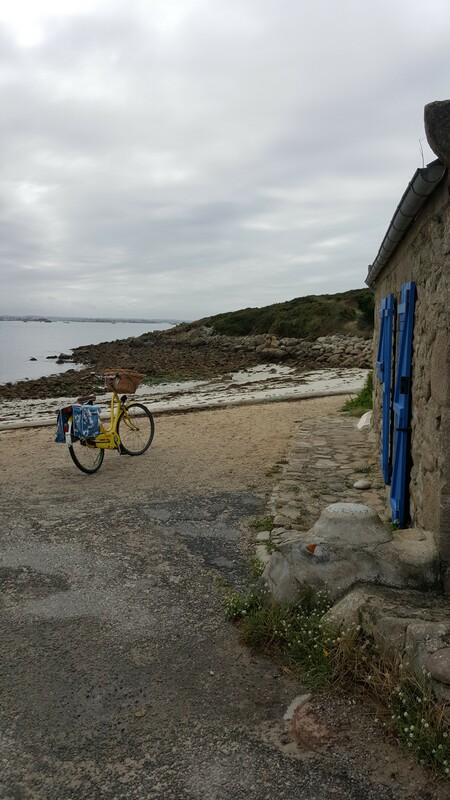 I had been planning a larger cycle along some of the greenways of Brittany when I spied this tiny island on google maps. The more I read about it, the more I was drawn to it and soon booked a small house in its village for the week. 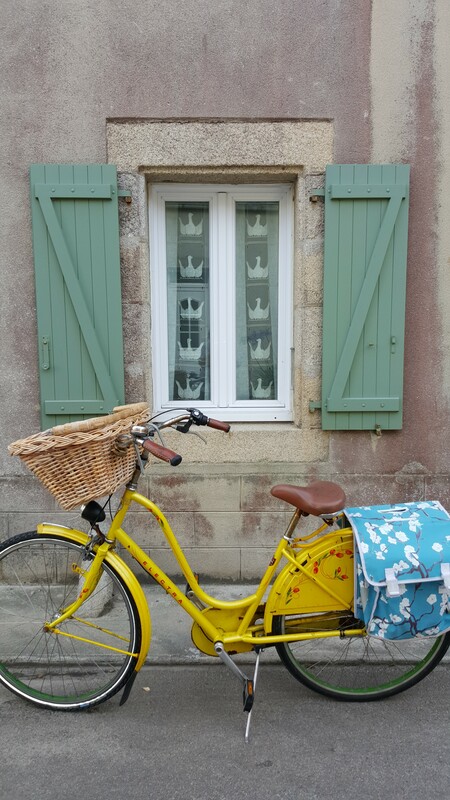 My plan was to cycle, walk, swim, write, draw, paint and take photographs. Oh and eat good food and drink fine wine. And I am inviting you to join me. 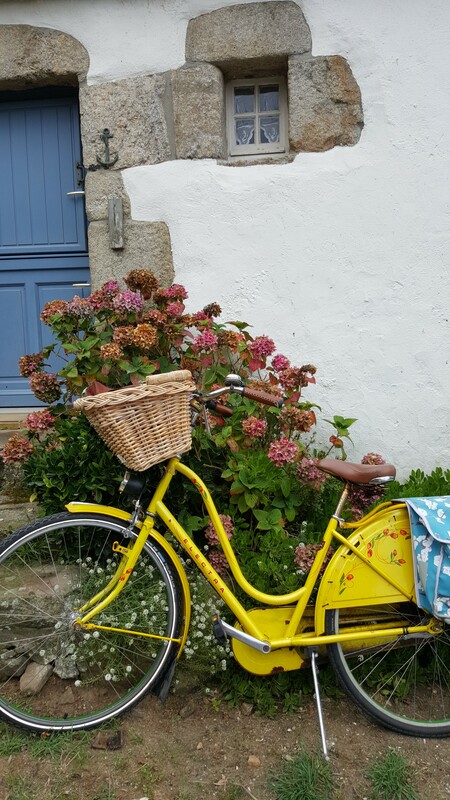 Writer, storyteller, Artist, photographer, mother and grandmother, with a passion for living in the moment, for nature and gardening and meditatively pedalling my yellow bicycle which helps inspire my stories and observations of life. And what better place to be from and to live and cycle in then Ireland. A country filled to the brim with songs and stories, small boreens, lakes, mountains and wild seas. In between all the above I just about manage to squeeze in my real job as a nurse in a busy Hospital. Stephanie Peppard an and Thewomanontheyellowbicycle and the inquisitive hen 2014/2015. This Written material, drawings, photographs and paintings are all my own original work. I would kindly ask that you do not use any of the above without my permission. Excerpts and links may be used provided that full and clear credit is given to Stephanie peppard and thewomanontheyellowbicycle and the inquisitive hen with appropriate and specific direction to the original content. thanks Steph. Begun in 2010, this blog offers analysis and reflection by Susan Bailey on the life, works and legacy of Louisa May Alcott and her family. Susan is an active member and supporter of the Louisa May Alcott Society, the Fruitlands Museum and Louisa May Alcott's Orchard House. My wild camping adventures on Dartmoor. A nordic journey from the past to the present with Denmark's largest Viking war ship, the Sea Stallion. Random Peckings and Droppings of a Free-Range Chicken Mind. A Wide Range of Topics Discovered Wherever Nourishing Thoughts Present Themselves. Glamping at its best!! private, own kitchen, own shower and loo, peaceful, wildlife, no kids!! It's all about the read.